Israel holds Earth Hour a little later than the rest of the world, but just in time for Earth Day. Stubborn as always, Israel insists on doing things a little differently. The official international date for Earth Day, the worldwide energy saving campaign, was on March 27th and many other Middle Eastern countries – such as Egypt and Dubai – observed it already. But Israel thought it would be better to observe Earth Hour a little later, on Earth Day, with a 14-city energy saving salute. 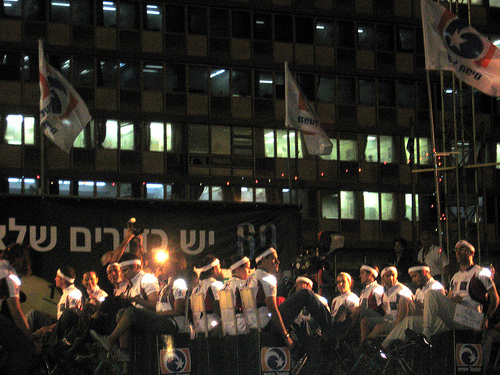 Tel Aviv: Tel Aviv already has its own Earth Hour tradition, in the form of a concert in Rabin Square that is powered by a team of cyclists and renewable energy (which sometimes comes in the form of upcycled falafel oil). Lights out at 8pm. Check out the details on the left. Nes Ziona: Like the other cities observing Earth Hour, it’ll be lights out for Nes Ziona at 8pm. Jerusalem: A few events will be going on in Jerusalem, including a family-oriented event on Sderot Mamila, a concert on the Old City walls after lights out at 8:10pm, and a street party on Shushan Street. Check out the poster below for more information. Dimona: Like the other cities observing Earth Hour, it’ll be lights out for Dimona at 8:10pm. 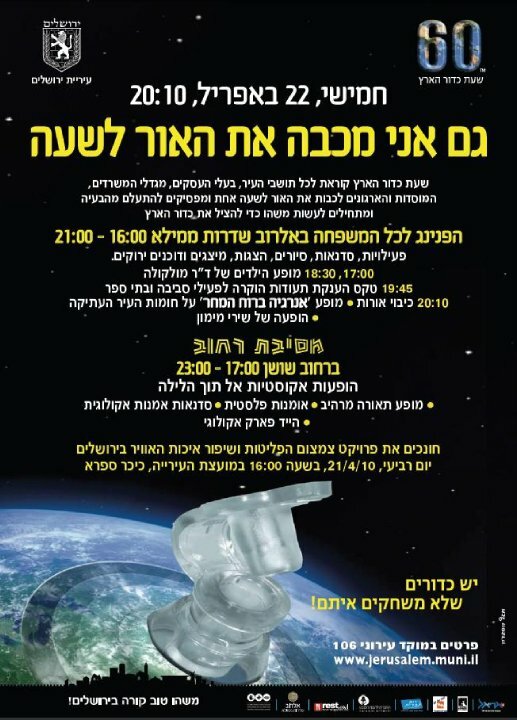 Yavne: Yavne is turning Earth Hour into a day-long event, starting at 8am with a school-wide environmental education hour and ending with a lights-out hour starting at 8:10pm. Haifa: Like the other cities observing Earth Hour, it’ll be lights out for Haifa at 8:10pm. 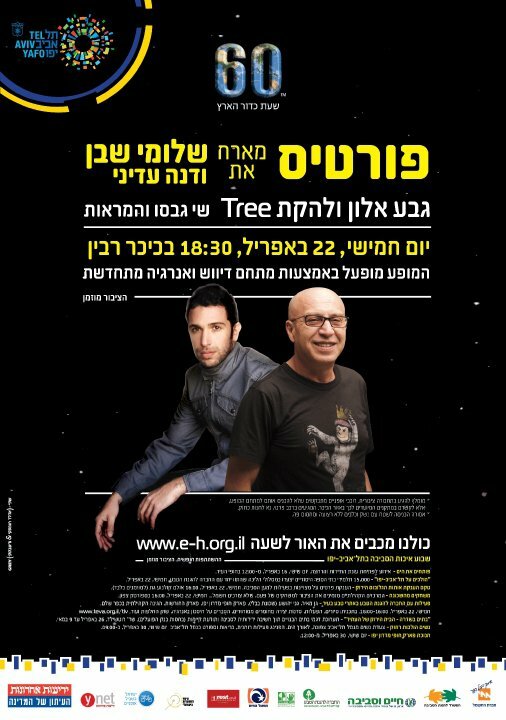 Kfar Saba: Kfar Saba will turn it’s lights off at 8:20pm, but before that a light-and-dark circus cabaret will be starting at 8pm. Modi’in Makabim-Reut: Like the other cities observing Earth Hour, it’ll be lights out for Modi’in Makabim-Reut at 8:20pm. Beer Sheva: Like the other cities observing Earth Hour, it’ll be lights out for Beer Sheva at 8:30pm. Eilat: Like the other cities observing Earth Hour, it’ll be lights out for Eilat at 8:30pm. Rishon Lezion: Like the other cities observing Earth Hour, it’ll be lights out for Rishon Lezion at 8:30pm. Ashkelon: Like the other cities observing Earth Hour, it’ll be lights out for Ashkelon at 8:40pm. Petach Tikva: Like the other cities observing Earth Hour, it’ll be lights out for Petach Tikva at 8:40pm. Raanana: Like the other cities observing Earth Hour, it’ll be lights out for Raanana at 8:40pm. For more information about Israel Earth Day 2010 events click here. For more news on Israel, see the Jerusalem Post. Previous Previous post: Are You Growing Poison In Your Garden? Next Next post: Time to Hook Your Car Onto the Road Train?